In creating this piece, I was considering the everyday language around traits like goodness, saintliness, morality, evil, darkness, and corruption. 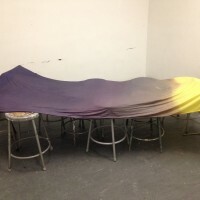 The two colors in the piece, yellow and purple, are opposites on the color wheel; here, they relate to the language of good and evil as opposing forces. However, these two elements rarely exist in true separation from each other. 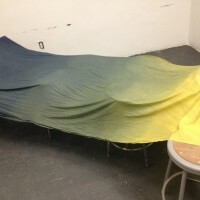 The grey area of the fabric, where the lightest yellow and deepest purple mix, takes up the largest amount of the fabric, and sits at the viewers’ eye-level; those who stand before the piece are asked to consider where they fall along its spectrum. I wanted to create something that acknowledges the everyday implications of ethics. There are myriad moral decisions we make in a day, but people are generally self-assured in their own actions and behavior, more likely to judge others for wrongdoing than acknowledge their own faults; or remain passive in the comfort that they aren’t directly hurting anyone so they are therefore good. 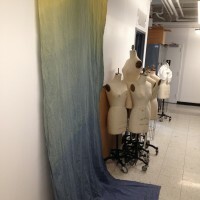 In the future, to encourage the viewer to really come up and look at the piece, I would like to incorporate various details into the fabric that reference moments of everyday life like thread, cotton, and buttons, but also jewelry and even trash. 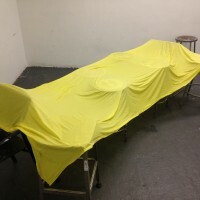 After running some tests on much smaller swatches of fabric, I dipped the entire twelve foot long piece of fabric into a five gallon bucket of yellow dye (I used dissolvable packets of fabric dye), stirred it for a short amount of time, then pulled the whole thing out, and rinsed and washed it with dish soap. 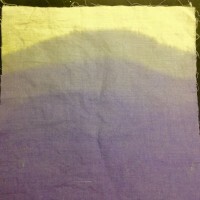 After the fabric dried, and I could see the exact tone of yellow, I re-wet the whole thing and began to dip-dye the fabric in a bucket of purple. 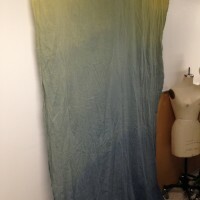 I lowered the fabric in up to about a foot and a half from the top most edge, but quickly pulled out the topmost layer so it would have the least exposure to the dye. 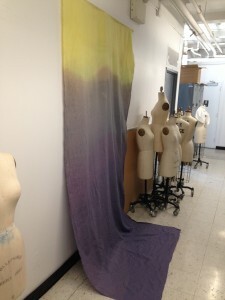 I left the fabric in for extended periods of time. I ultimately did this twice because the first attempt left the fabric a greenish-blue rather than purple. 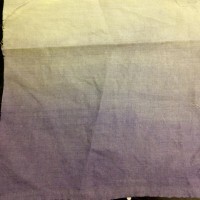 After dip dying over the greenish fabric, I dipped the very last few feet of fabric in a mix of purple and black dye distinguish the end, and painted with bleach over the topmost section of yellow. Although I bleached it in order to make it much lighter, it succeeded instead to clean up this section, getting rid of any purple dye that had accidentally landed on it.